Samsung latest device Galaxy M10 is now available for purchase in India via Amazon. This budget device has been launched in India at a starting price of Rs 7,999, which brings this phone closer to the RealMe C1 that is also available for Rs 7,000 (appx) in India. 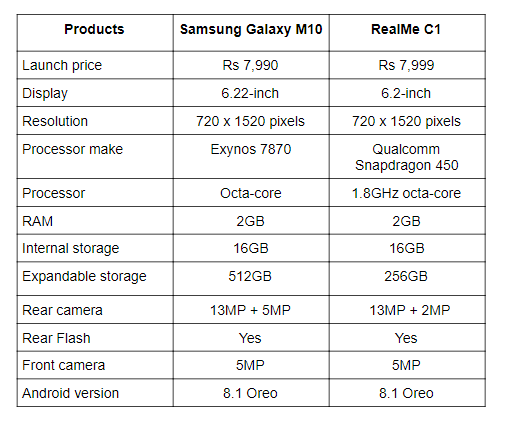 Samsung has recently launched two new smartphones in India Galaxy M10 and M20. The Galaxy M series is currently available in India only and haven’t released in other countries yet. Samsung has kept the price of both the smartphones under Rs 15,000. On the other hand, we have the RealMe C1, which is also available in India around the same price as the Galaxy M10, which makes this RealMe device a direct competitor of the Galaxy M10. So, let’s begin with a quick specifications comparison to see which device is offering the best hardware at least on paper. Let’s begin with comparing the display of these two smartphones in detail. The Samsung Galaxy M10 has a pretty big 6.2-inch display that offers a resolution of 720 x 1520 pixels. The Samsung has provided a small water-drop notch on top of it, which houses the front-facing camera. The RealMe C1 also sports a 6.2-inch display that comes with a resolution of 720 x 1520 pixels, same as the Galaxy M10. 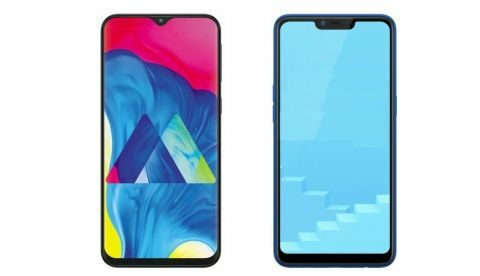 However, the device is equipped with the old traditional notch on top, which is quite bigger than the notch that Samsung Galaxy M10 comes with. When it comes to the processor, the Samsung Galaxy M10 is powered by Samsung’s own Exynos 7870 octa-core processor, which is coupled with 2GB RAM and 16GB internal memory. The phone is also launched in 3GB/32GB variant that is available for Rs 10,999. The RealMe C1 is backed by a Qualcomm Snapdragon 450 octa-core processor that is paired with 2GB RAM and 16GB internal memory. As far as the cameras are concerned, the Samsung Galaxy M10 has a dual 13MP + 5MP rear cameras. The 5MP sensor can be used for capturing wide-angle shots. The device comes with a 5MP sensor on the front for clicking selfies. On the other hand, the RealMe C1 sports a dual 13MP + 2MP sensor on the back along with a 5MP unit on the front.